It allows you to ask the user to enter some text (using the text input window) and then do something with the given input. I imagine a script that does this is already around though. "title" is a string that will be displayed. Sort of like reminding the user what the question was. Variable is the variable that the text will be stored in. Default 1. I would prefer if it were available directly on Scene_Map so you could display both a game message as well as the text input. Sort of like the number input. I would also like to see an input system that allows users to directly type it in with their keyboard. This is cool, I expect some very good memory reliant puzzles could be built with this script! Where is the English, why this Japanese?! Maybe you're using the japanese version of RM. @Nightgazer Starlight, I had that problem as well once. I think it was because I had the japanese trial installed before I bought the english version. That should hopefully work for you. If not, then I have no clue. And Tsukihime, very nice script. I have some ideas for this. Not sure if I can implement them how I imagine, but I am going to try. Didn't realize the trial would mess with the install of the version I paid for. You would use a script in the conditional branch. Hey what do you do with the variables? quiz : when my mother bought some juices ? if he answer " september " it comes the right value. and if he answer the wrong value, nothing will happened. how to make that ? @nyxzryu: you can insert anything to variables. just select change variable. and in "operand" choose Script. then you could add any text (and even object). show input window with title: "when my mother bought some juices ?" 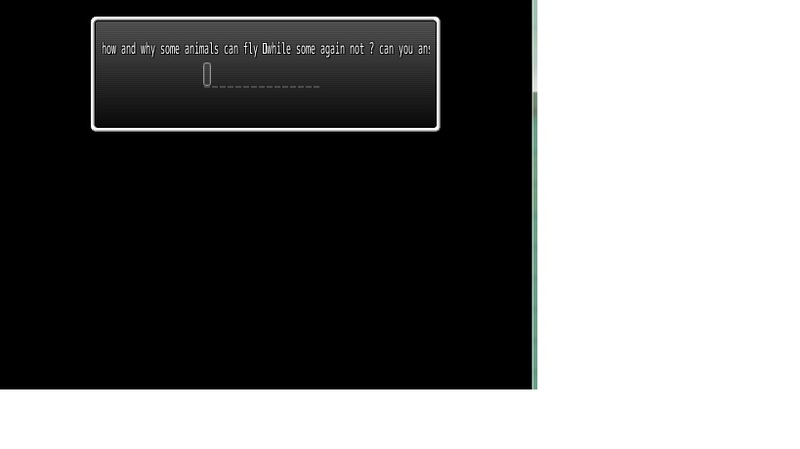 3) the user will input the answer. 4) conditional branch: 4th tab: Script: $game_variables.downcase == "september"
if true show message "you're right..."
else show message "you're wrong"
i get it now, so the variables are changeable isn't it ? but i still confused about ( downcase == "september" ), what is downcase means ? i changed it to uppercase, it always comes with the right answer when i filled the answer with both uppercase and lowercase letter. .downcase and .uppercase is method for string. It convert string to downcase or upper case. Downcase: "my name is boboy"
Uppercase: "MY NAME IS BOBOY"
The downcase and uppercase is used so the answer doesn't need to be case sensitive. You don't want your player to angry because they got wrong capitalization. Star Wars fans should have a name. I am a Star Warrior. Haven't tested this, but I can see how this can be useful. i can;t enter long text for the "title". i want to make somekind of quiz just like i said before, but when i input not-too-long "title", it's not shown up. Need script edit to modify the window. I've been just using the name input to do stuff like this in my games but I have been limited to the 16 character max for the input. Is there a limit on how many characters can be typed in? Also, it's looking like people are having trouble with text that exceeds the window size, it runs off the screen. Is there a way to alter the script to make it so that it wraps into a second third and maybe fourth line when it gets too long? I have not taken the time to look at multiple lines but the easiest way would be to have a fixed number of characters per line and then check how many characters have been entered to determine where the cursor should be placed. yeah i agree with kevin, is there a way to doing so ? 1. What are the conditions to use this, if any. 2. I get the script call, but where do i actuall put the script itself? I tried putting it Materials (Insert Here) section of the script editor, but I just keep getting errors whenever a script call for this is reached. What am I doing wrong? But all in all this sounds so awesome, I really can't wait to get this working.